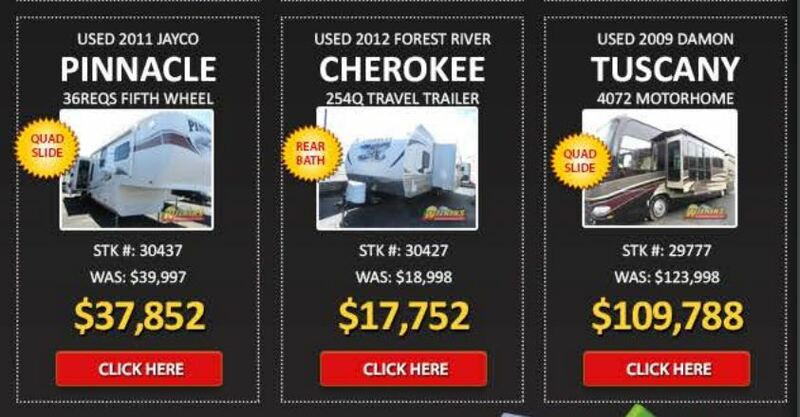 Don’t Miss Black Friday Sale Specials At Wilkins RV! After Thanksgiving Deals are almost here so get ready to Save BIG on your RV wish list. You won’t want to miss out on incredible Black Friday Savings At Wilkins RV! From RV accessories to New and Used RVs, we’ve got your travel needs covered at Wilkins RV! But don’t wait, this Sale Expires on November 26, 2016! Don’t pay us a penny in monthly payments until 90 days after the sale. This gives you time to enjoy your new RV and have a little extra cash in your pocket for the holidays and travel fun for the next 3 months. Finance offers available O.A.C. Looking for the perfect gift for the RVer in your life? Wilkins RV Gift Cards are 10% off only until Nov. 26 2016. What a great deal! Now is the perfect time to buy a New RV from Wilkins RV! Imagine starting out the year with a New Travel Trailer! The family friendly 2017 Heartland Trail Runner 27 SLE Travel Trailer can be yours for only $167/mo*.This bunkhouse towable has plenty of room for every at a price that’s easy on the budget. Looking for a quality New Fifth Wheel at an amazing price? Check out the 2016 Heartland Bighorn 3875FB Fifth Wheel for only $414/mo! * Luxurious RV living can be yours this Christmas! Looking for a quality Used RV? We’ve got over 200 pre-owned gems ready to go! Whether you are looking for a Used Class A Motorhome, Class C Motorhome, Class B Motorhome, Fifth Wheel, Travel Trailer, Toy Hauler, Destination Trailer or Fold Down Camper, you are sure to find the perfect Used RV to fit your travel needs. But time is ticking! After Thanksgiving, visit our Wilkins RV locations in Rochester, NY or Bath, NY and take advantage of these limited time offers. Sale ends November 26!